Flatliners is a re-imagining of the sci-fi horror thriller of the same name that released in 1990; starring Kiefer Sutherland, Julia Roberts, Kevin Bacon, William Baldwin and Oliver Platt that achieved iconic cult status. 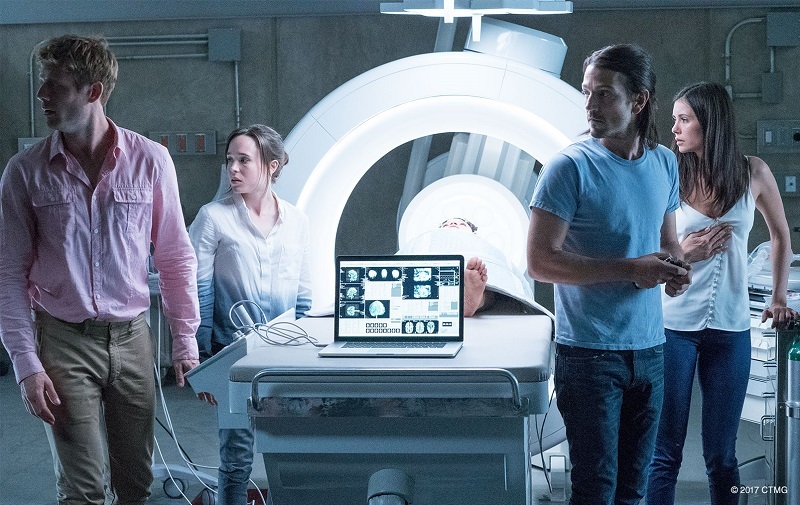 Can the 2017 Flatliners reboot actually improve upon the original Joel Schumacher Oscar and Saturn award nominated film? 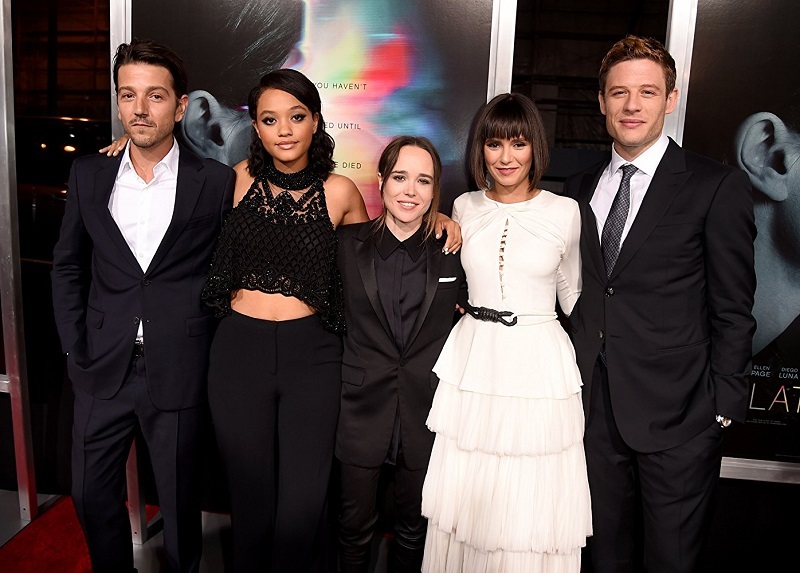 The story of Flatliners revolves around the premise of the original film, although the instigator of the experiment has significant motivation as five medical students work together to discover what happens after death; however there are unexpected consequences in each of their lives as secrets from their past begin to haunt them as they collectively frantically attempt to find a way to prevent their ever increasingly frightening nightmares. 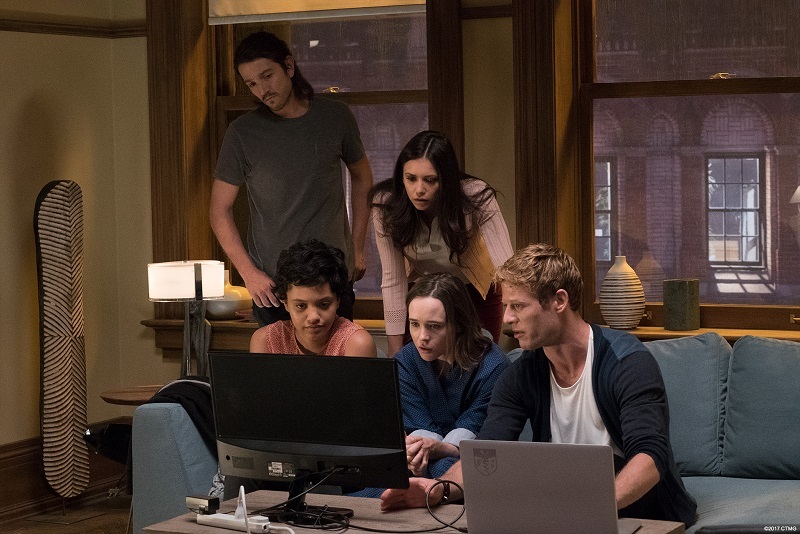 One of the interesting topics at play within the 2017 version of Flatliners is that due to the scientific and technological advancements over the 27 years in between the two films; the premise of the story is actually now far more believable than what it was in 1990 in a way that blurs the lines of science fiction and science fact. 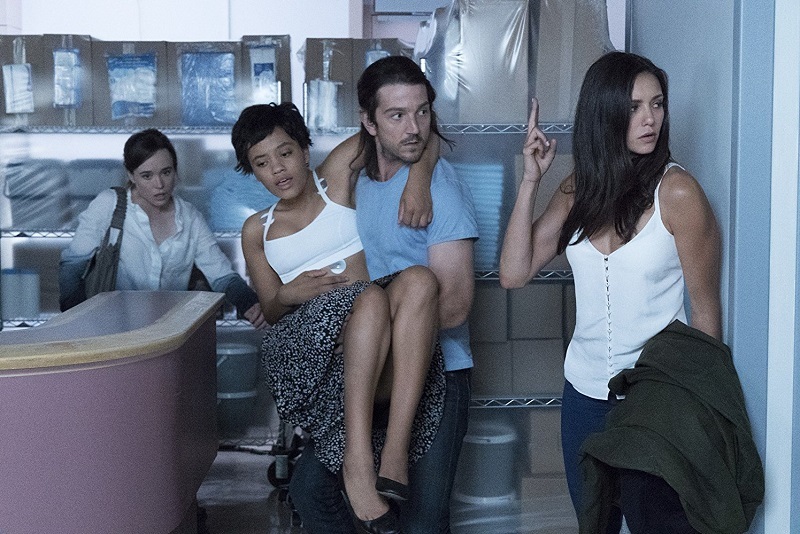 Flatliners has an appropriate pacing as the first 25 minutes introduces the audience to the personalities and everyday scenarios lived by the group of five characters before the first experiment with some elements of horror beginning around 32 minutes in; becoming a main staple of the plot going forward interlaced with celebrations immediately after another member of the group has survived their flatline experience. However, the horror tones increase in their frequency as the story progresses to such a point in which the latter half of the film is almost completely focused on horror, but in a way that it never feels forced as multiple characters have unique manifestations from their flatlines. Dialogue is always of an excellent standard, although there is a scene in which Ray plays a prank on Jamie by switching out his patient’s medical charts that was a bit uncomfortable to watch due to the subject matter, although on the flip side of that; it provides a glimpse into a lighter side of Ray’s character which for the majority of the story is the voice of reason in contrast to everyone else’s insanity. Ray and Marlo have a particularly light hearted moment in which he describes to her why he respects her as much as he does that required delicate writing that was not only achieved but also complimented by an equally excellent delivery and reaction from Diego Luna and Nina Dobrev respectively which elevated the scene to an incredible level of quality. 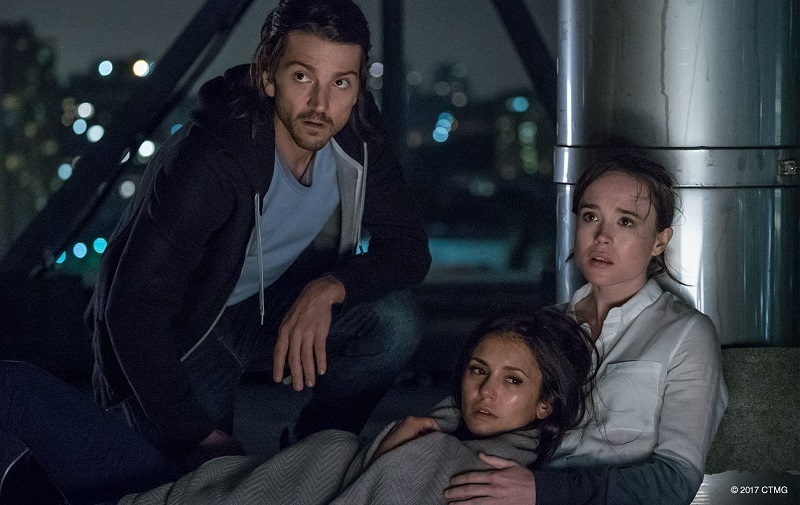 Flatliners features an ensemble cast starring a core cast of Ellen Page as Courtney (Inception and Beyond: Two Souls), Diego Luna as Ray (Contraband and Rogue One: A Star Wars Story), Nina Dobrev as Marlo (The Vampire Diaries and The Return of Xander Cage), James Norton as Jamie (McMafia and Grantchester) and Kiersey Clemons as Sophia (Bad Neighbours 2 and The Flash). The entirety of the cast from the core cast including the group of five friends to their related characters from past and present are all superbly acted as friendships grow stronger, relationships form and those carrying out flatline experiments go from their everyday professional lives to the unfolding of their past meeting their present. 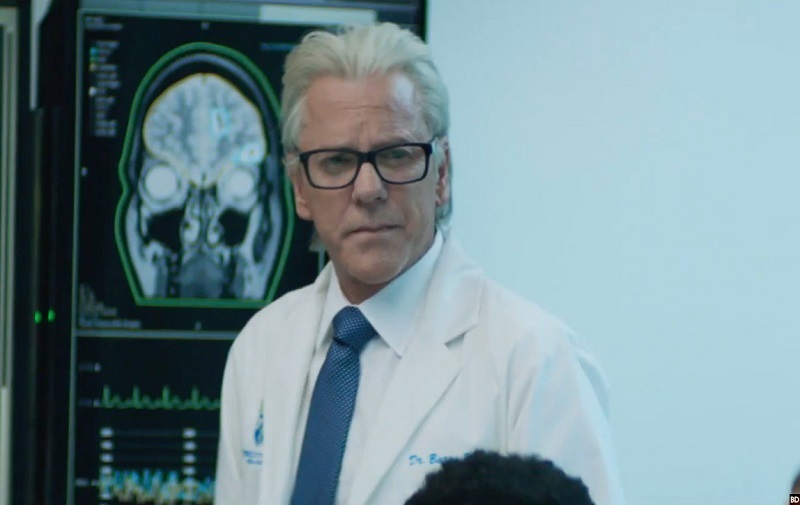 Everyone was initially of the belief that Flatliners was a sequel due to Kiefer Sutherland’s involvement, although he actually plays a character named Dr. Barry Wolfson instead of reprising Nelson Wright from the previous film. 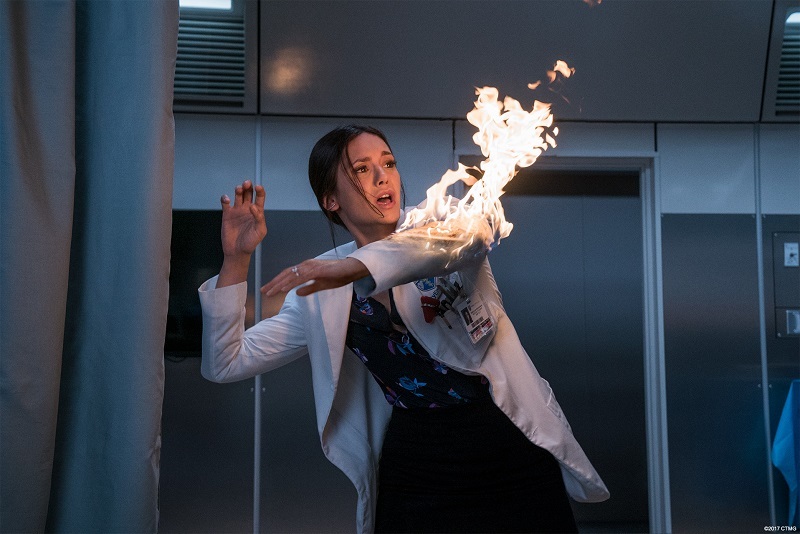 Therefore, Flatliners is seen as a re-imagining in the style of Terminator Genisys in the sense that there is original material mixed with a difference in the origin of the back story rather than a sequel. The crew includes award winning director Niels Arden Oplev (The Girl with the Dragon Tattoo), while Ben Ripley wrote the screenplay (Source Code 1 and 2) based upon Peter Filardi’s story and veteran actor Michael Douglas returns in the role of producer from the original film. Visually, the special effects are impressive from the moment they are introduced shortly into Courtney’s flatline in which she imagines the room imploding in on itself as particles fly back and forth. Facial skin tones during each flatline experiment look realistic to every character’s situation from having their heart stopped to the concern and panic of friends standing at their side in attempts to resuscitate, while lighting and shadows are amazing throughout as they increase the atmosphere from beginning to end. Flatliners could have efficiently utilised a 4K Ultra HD Blu-ray and a 3D Blu-ray release. For instance, a scene in which Courtney walks through numerous lights would have stood out in 4K due to the bright lights or stereoscopic 3D for the depth of the lighting which can also be stated for every flatline scene such as the camera panning on Marlo’s flatline would have been perfect for stereoscopic 3D. As with any film that contains horror elements; the audio always has to be on point and Flatliners is no different in that aspect with flawless DTS-HD Master Audio 5.1 lossless quality that pans from side-to-side accordingly such as during the intro when people are discussing their outer body experiences which creates a far greater atmospheric effect. In fact, as soon as the horror tone is introduced; the audio starts kicking into overdrive to accent specific occurrences as multiple characters endure hauntings from their past and continues to do so from that moment on with crescendos of climactic sound effects that are complimented by music that captures the tone perfectly. Flatliners’ value on Blu-ray stems from a digital version of the film included for viewing on smart TVs, computers, tablets and smart phones. Meanwhile, there are various special features with the main highlight being over 12 minutes worth of deleted, extended or alternate scenes that are all more than good enough to be in the final version of the film that provides more screen time for each of the core cast and even some of the fringe characters. 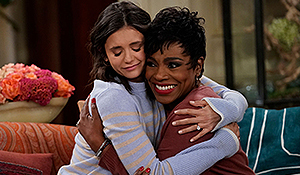 For instance, Kiefer Sutherland delivers a powerful scene, while there are two more intense horror scenes for Nina Dobrev’s Marlo and there are even a couple of characters introduced such as a love interest for Courtney and Marlo. However, there is no alternative version of the film containing the extra scenes which could have potentially featured branching storylines such as a different fate for characters based upon where the deleted, extended and alternate scenes would have led them resulting in different endings. Elsewhere within the special features; Reviving A Cult Classic divulges what the cast thought of the original Flatliners with comparisons between some scenes, while Making the Rounds provides some insight into the cast’s viewpoint of their respective characters with director Niels Arden Oplev and producer Michael Douglas giving their thoughts on the casting process for the five medical students, alongside Just What the Director Ordered that showcases how the film was directed from the perspective of numerous members of the cast and crew; and the Ultimate Question poses the question of whether the cast and crew have the curiosity to flatline and be brought back. Overall, the re-imagining of Flatliners has a lot going for it as the entirety of the talented cast performs their respective roles to a high quality through well written and directed dialogue, plot twists and genuinely scary scenes. Flatliners is highly recommended to fans of the original film, while horror film buffs will enjoy how Flatliners becomes gradually scarier as the story progresses, alongside fans of the actors, actresses, writer and director that have brought this fascinating remake to life. Flatliners can be purchased in America’s region 1 Blu-ray and DVD from Amazon US or as a digital download via Amazon Video. Flatliners can be purchased in Europe’s region 2 Blu-ray and DVD in-store and online from HMV, alongside Amazon UK on Blu-ray and DVD or as a digital download via Amazon Video.